The Roma Garment Duffle Bag packs a suit + your clothing. The inside has 2 multi-function pockets for shoes, tablets, and bulky charges. Uni-zipper design provides easy access to inside storage when traveling through TSA. It comes in full grain vegetable tanned leather and finished with brass hardware. Roma convertible leather garment bag includes a suit hanger and built-in closet rod hook. Made in Italy. 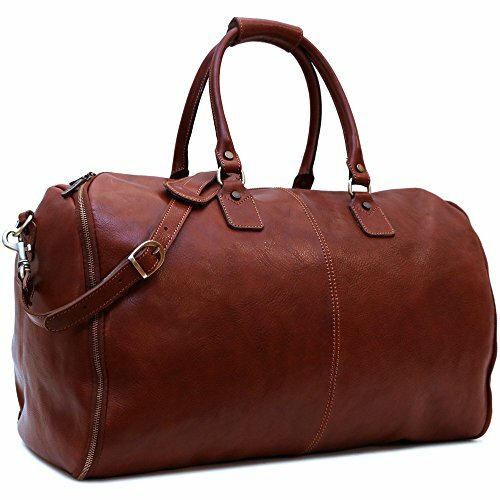 Garment Duffle Bag - this bag unzips on all sides to pack a suit + your clothing. Very easy to pack for a business trip or wedding weekend - it zips up into a classic duffle bag style. Size - 22" L x 13" H x 11" D. The inside has 2 multi-function pockets for shoes, tablets, and bulky charges. Uni-zipper design provides easy access to inside storage when traveling through TSA. Brass Zipper / Detachable Shoulder Strap this is adjustable 42" - 46"